Seeking a company to streamline and manage supply chain and logistics needs. Strengths include developing innovative ideas for increasing profits, managing multi-million dollar accounts, finding solutions to improve logistics, and excellent problem solver. Set up and train all new internal and external users of Navision (ERP Software). Lead help desk operator for customer's Navision issues. Keeping abreast of all Navision updates. Advise customers of latest enhancements available for their specific needs. Give presentations to potential customers to outline how their needs can be addressed. Analyzed production samples via governmental test specifications. Reported samples which did not meet specifications to Quality Assurance. Attended Annual training for improved performance and safety. Directed all aspects of Carter County High Schools after school program. Responsibilities included: managing 96 employees, developing and managing all after school programs (middle school and high school tutoring, physical activities, extra-curricular activities, extreme sports, soccer, college exploration, etc.). In charge of $400,000 budget which included purchasing and payroll. Submitted annual state report to ensure additional funding. Developed ways to shorten time in reporting results to manufacturing. Proactively reviewed issues concerning testing. 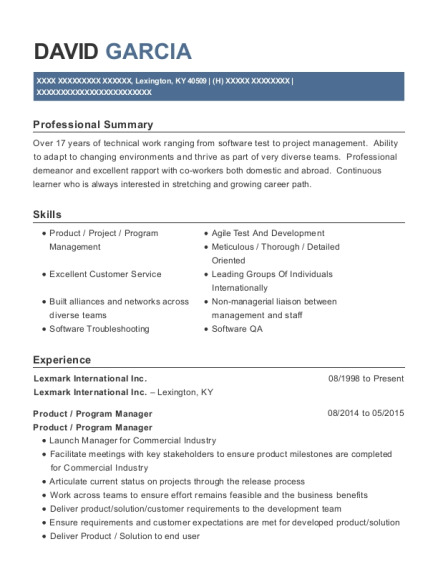 Lead team manager for Lowe's Home Improvement (global account) for imports and exports. Analyzed logistics for Lowe's imports and exports Evaluation of suppliers. Negotiated annual multi-million dollar contract bid. Introduced new service offerings to improve cargo flow and supply chain. Single-handedly managed the operation of imports for company's largest account, Wal-Mart, with a revenue of $255 million in 2003. Logistics analyst responsible for streamlining the supply chain and movement of cargo. Worked closely with United States Government agencies for customs clearance of cargo. Exceeded first year revenue collection goal of $10 million by 17%. Concept adopted by worldwide corporation. Key member of initial team to establish a new business line. Established a system for storage charges, which included 19 ocean terminals and over 60 container yards in the U.S. for Maersk. Member of the Roan Mountain Citizens Club. Treasurer for Roan Mountain Citizens Club, 2007-2014. 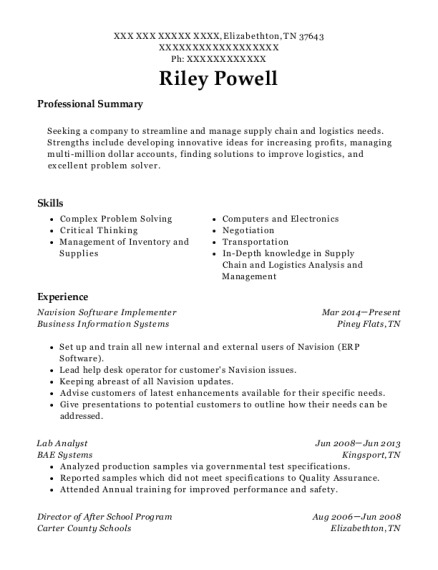 This is a resume for a Navision Software Implementer in Elizabethton, Tennessee with experience working for such companies as Business Information Systems and BAE Systems. 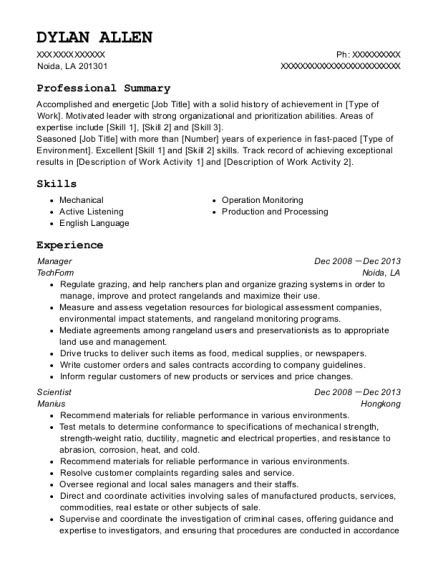 The grade for this resume is 0 and is one of hundreds of Navision Software Implementer resumes available on our site for free. 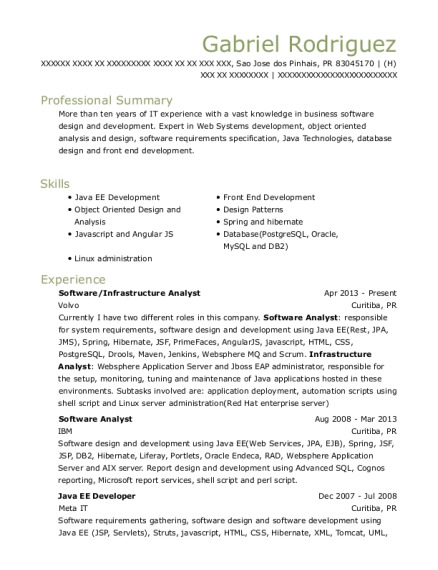 Use these resumes as templates to get help creating the best Navision Software Implementer resume.